Two years ago the head of Heineken in Russia, Roland Pierme, set a target of capturing 15 percent of the Russian beer market. "Russia is a very big country, and in order to survive you have to be a big company. Our market share should be at least 15 percent," Pierme said in September 2003 to business daily Vedomosti. "This goal could be reached either by increasing our own production or by acquiring competitors." 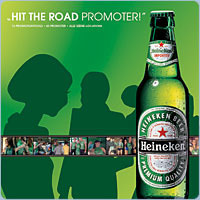 At the time, Heineken's market share was just 6 percent, and Pierme's declaration seemed more than optimistic. This year, in the space of three months, that perception has radically changed. Between May and July the Dutch brewer has made three acquisitions, considerably bolstered its production capacity and swooped up almost 11 percent of the country's beer market, according to analyst estimates. The company now owns six breweries in Russia: Bravo and Stepan Razin in St. Petersburg, Patra in Yekaterinburg, Shikhan in Sterlitamak and Volga in Nizhny Novgorod. This makes Heineken Russia's No. 2 brewer and about 5 percentage points behind the country's No.2 brewery, Sun Interbrew. However, Alexei Kedrin, spokesman for Russia's leading brewery, Baltika, says the Dutch firm "has a very big chance of becoming No. 2." Alexei Krivoshapko, an analyst with United Financial Group, estimates that an organic change at No. 2 could take place in two to three years. Aton brokerage already lists Heineken's next target as Pivindustria Primoriya, a brewery Sun Interbrew sold its 29 percent stake in to Alfa Eco last month. In addition, one of the country's last independent plants, Ivan Taranov, put itself up for auction last month. Alfa Bank analyst Yelena Borodenko estimates Ivan Taranov's market share as 5.3 percent. Industry watchers say Heineken is a potential buyer. Sun Interbrew could not comment last week as it prepared to list financial results on its bourses in Europe. A heightened focus on acquisitions and consolidations on the Russian market has come about just as the country's "beer boom" is set to fizzle. Heineken said they expect the Russian beer market to grow by 5 percent this year - a massive drop from the 12 percent surge in 2004 beer sales. Troika Dialog's analyst Victoria Grankina said that even 5 percent may be too optimistic. As the beer industry matures, annual growth will decline to be almost in line with the traditional beer markets of Europe and the U.S. Expansion of production volumes and breweries' market shares will become more and more expensive. Analysts estimate that Heineken has already spent $170 million on acquisitions this year and the stakes for new purchases are set to skyrocket. Just this Monday, Sun Interbrew paid $201 million for St. Petersburg's Tinkoff brewery - twice the sum that analysts estimate Heineken paid for the Stepan Razin brewery, which has a similar production capacity. Tinkoff commands just 2.1 percent of the Russian market, though Sun Interbrew said the buy will be important primarily in bolstering their presence in St. Petersburg. The No.2 brewer accounts for just 3.7 percent of beer sales in St. Petersburg, Russia's largest beer market where local brands dominate. With all major players apart from Baltika complaining of production capacity constraints, the last few independent breweries will hold out for handsome premiums should an acquisition offer come along, says Alfa Bank's Borodenko. She estimates the independent Krasny Vostok beer plant in Razan as worth close to $1 billion, while Reuters quote the starting price for Ivan Taranov as $400 million. In a research note to investors, Aton predicts that alongside Krasny Vostok, Pivoindustria Primoria, two more local breweries - VINAP and Barnaul Brewery - will be snapped up by multinationals over the next year. "Ochakova is the only independent Russian brewery that, in our view, will withstand a takeover in the short term," the note said. Baltika's Kedrin says that despite the costs, acquisitions still make sense in Russia, since building new breweries may be as expensive, if not more. Furthermore, construction is time-consuming, requiring at least two years per plant, he said. Although analysts agree that Russia's remaining independent breweries will be snapped up come year's end, who will pick up the bill for them has been the subject of much speculation. Of those already present in Russia, Turkish brewer Efes and American SABMiller get the analysts' vote alongside the expansion-eager Heineken. Also praising Russia's potential are global brewing giants Asahi and Anheuser-Busch, though the companies remain tight-lipped over possible moves to set up production in the country. "Russia is an attractive beer market because there is good volume and per capita beer consumption is rising," Stephen Burrows, the CEO and President of Anheuser-Busch, said in an e-mail. Buying a relatively small brewer like Ivan Taranov would be an unusual move for Anheuser, which controls almost half the U.S. market. Troika Dialog's Grankina does not rule out that the Americans could be interested in more. "It's not impossible that Anheuser-Busch would come in and buy a major player in Russia," Grankina said. One attractive possibility for Anheuser could be Efes brewery, the country's No. 4 beer company, with an annual production capacity of 11 million hectoliters. Meanwhile, Kedrin points out that the country's leading beer brand Baltika could yet activate its purse. "Theoretically, Baltika too could make more purchases," he said. Although the brewery belongs to Baltic Beverages Holding, the country's largest beer company with a 33 percent market share, the Baltika brand by itself accounts for only 24 percent of the market - less than the third the antimonopoly service draw as the limit, Kedrin said. Business news archive for 20 July' 2005.
Business news archive for July' 2005.